President & CEO « Hamadeh Educational Services, Inc. - Educational Service Provider (HES) Apply Online today! Meet Mrs. Nawal Hamadeh, President and CEO of Hamadeh Educational Services (HES). In 1998, Mrs. Hamadeh established HES to provide top-quality educational management services to public school academies and assist them in preparing Pre-K through 12th grade students for their future success as responsible, upstanding citizens and leaders in a rapidly changing global society. 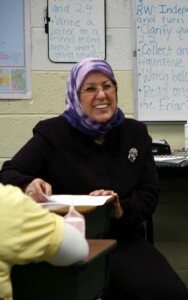 Mrs. Hamadeh subsequently founded four academies (Star International Academy in Dearborn Heights, Universal Learning Academy in Westland, Noor International Academy in Sterling Heights and Universal Academy in Detroit) where today she serves as Superintendent and CEO, overseeing operations and a combined academic community of 400 staff members and more than 3,300 students. A native of Lebanon and a prominent member of the Arab American community, Mrs. Hamadeh has served as a public and private school educator in the US and abroad for more than 30 years. As a passionate advocate of every student’s right to a nurturing, loving, and caring learning environment, Mrs. Hamadeh has dedicated her career to improving the lives of children through education. Greetings, and may peace be upon you all! It all started with a dream…a dream to establish schools where students not only go to master academic skills, but also to engage in a holistic learning experience for the mind, body and soul. I am a firm believer that the world is shaped in our classrooms, and the way we educate our students today shapes the world of tomorrow. I also believe that, given the opportunity, each and every student is teachable, and every student has the potential to achieve his or her full potential. This, then, is my dream: for each child to discover his or her own dream and to have the opportunity to fulfill that dream. I witness my dream being fulfilled every day in the achievements of my students, both past and present. As I walk through the hallways of the academies, I see the leaders of tomorrow, the innovators, the difference-makers. I see a bright future for our nation and our world. And I see every reason to be, at once, humbled and proud.